The new Advanced Structures Lab will include a high bay laboratory with specially engineered floors and walls capable of handling extreme structural testing loads; a geotechnical test chamber; a concrete materials research and testing laboratory; a wind testing facility and faculty and graduate student spaces. 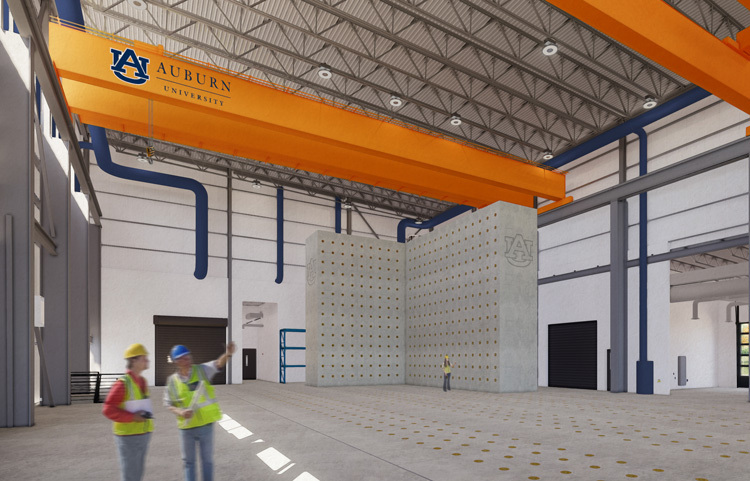 Auburn, Ala. — Auburn University is taking another giant step as the Southeast’s leader in structural engineering research and instruction through the construction of a $22 million Advanced Structural Testing Laboratory. The 41,500-square-foot facility will include a high bay laboratory with specially engineered floors and walls capable of handling extreme structural testing loads; a geotechnical test chamber; a concrete materials research and testing laboratory; a wind testing facility and faculty and graduate student spaces. The 4,700-cubic-foot geotechnical test chamber is a unique feature — one of the few across the nation included in a university laboratory. It will allow students and faculty to conduct testing that has only been possible in the field until now on structures such as foundations, anchorages and towers. In addition, the wind testing facility will allow replication of the dynamic wind loads induced by hurricanes, tornadoes and other extreme wind events on large-scale specimens. These unique features, and many more, will accelerate research aimed at reducing the impacts during extreme events, and increase lifespan and safety of structures under all loading conditions. A new Advanced Structures Lab will help boost Auburn’s structural engineering research and instruction. The laboratory will be located near Auburn University Facilities Management offices on West Samford Avenue. The construction of the new facility will allow the Samuel Ginn College of Engineering to repurpose the current structural laboratory space in the Harbert Engineering Center for other academic and research programs.